Remember those old, tired convenience “diet” meals of years past? Expunge those foul memories henceforth from your minds, and purge, forevermore, the images of floppy broccoli, lifeless bits of cow, and promises that were never delivered upon by other frozen packages. Atkins has nailed it. Hard. Hard, my friends. 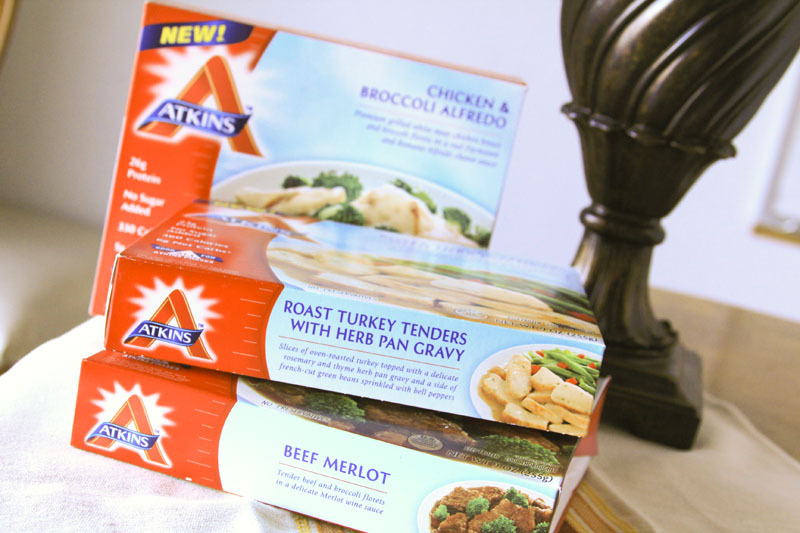 Whether you’re at your mom’s house, the dorm, or the office, Atkins Frozen Meals are convenient for breakfast, lunch and dinner when you don’t have the means to prepare a home-cooked meal, either due to time or circumstances. With Atkins’ new, healthier options, you can enjoy breakfasts like their Farmhouse-Style Sausage Scramble and Tex-Mex Scramble, or meals like Chicken & Broccoli Alfredo, Roast Turkey Tenders with Herb Pan Gravy, Beef Merlot, Crustless Chicken Pot Pie, Meatloaf with Portobello Mushroom Gravy, Italian Sausage Primavera, and Chile con Carne–and for generally less than the price of fast food ($3.50-4.50 each). They don’t skimp on portion sizes, and did I add that each meal only contains 4-7 net carbs? You could eat that standing on your head (though it makes swallowing difficult and messes up your hair…so don’t do it). And because each meal also contains only 310-390 calories, they’re fantastic for the low-carber when there’s no time to cook (or when her oven catches fire and she doesn’t have one for a week now. 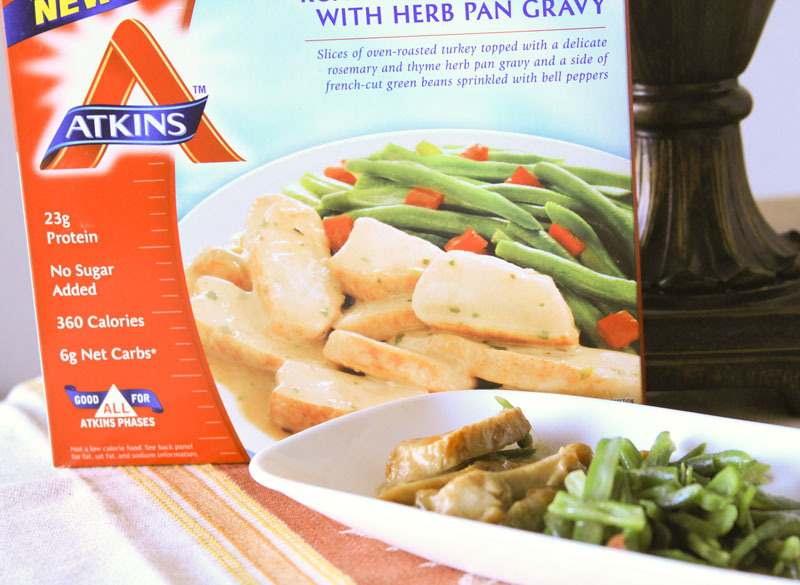 Each meal is acceptable in all four phases of Atkins. I also really appreciate that the recyclable tray can be used in both the microwave and in a moderate oven at 350 degrees (when placed on a baking sheet and watched closely). What would you say to tender beef marinated gently in a delicate Merlot wine sauce with broccoli florets? I say Merlot makes me feel so fancy, I ate these tender bites of beef with my pinkie raised upright. Juicy and with my favorite condiment (winning), the gravy, beef and broccoli come together, embrace, and share some warm stories around the fire (metaphorical fire. My oven isn’t aflame again) about how this ample meal contains only 6 net carbohydrates, 310 calories and 16 grams of protein, and then leaves for the evenings, promising to gather again soon. Since this delightful dish contains both wheat and soy (I have an intolerance to both), I was only able to sample carefully, but the flavors were spot on. I love this dish. 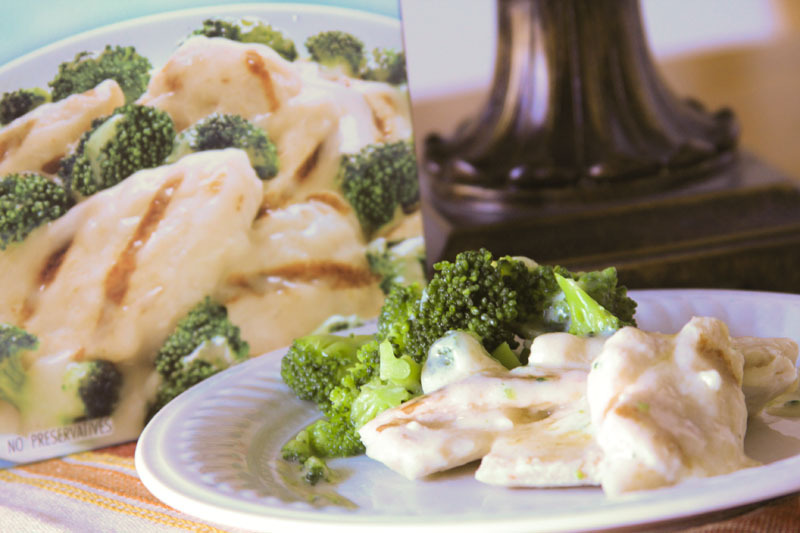 Here, moist grilled white meat chicken breast and broccoli florets are nestled in a cheesy sauce blanket of real Parmesan and Romano Alfredo for a nice, light, combination that provides both color and flavor to grilled chicken breast. For only 5 net carbs, 330 calories and a whopping 26 grams of protein, I am fairly pleased with the surprising tenderness of the chicken and the sauce, which is so robust and flavorful that it’s hard not to attack the corners of the bowl with a spoon. The broccoli is a pleasing color and texture and melds well with both the protein and the dairy. I’m, thankfully, fine with the limited amounts of dairy, and while I tend to have to avoid soy, I noticed no problems at all with either as a result of this meal. Thank you, thank you, thank you. In my absolute favorite combination, slices of oven-roasted turkey share center stage with rosemary and thyme herb pan gravy and a generous side of French-cut green beans sprinkled with bell peppers for a robust, delicious meal I could enjoy again and again. Forget that turkey is my absolute favorite fowl, this buttery meat is accompanied by a satisfying, smooth gravy–and all for only 6 net carbs, 360 calories, and 23 grams of protein. The green beans pop with both color and flavor and a pleasingly firm texture, and not a single piece of of the vegetable side remained to tell any tales. The dairy and soy contained in the recipe didn’t cause me the typical problems I have with both ingredients, which leads me to believe this dish is pretty safe–at least for me. Of all of the terrific meals I tried, this one is, hands down, my absolute favorite for its inspired take on the Thanksgiving dinner you might have wished mom had made. Look for these frozen options throughout select Walmart stores December 15, 2012, with availability in most major retailers January 2, 2013. Overall, these meals are positively divine, are simple to prepare, and are absolutely worth trying on those nights when you’re simply too busy being too fabulous to prepare something from scratch. While I probably wouldn’t buy these for myself, the need for this product rests on my college sophomore son, who is about to head off to college (Go Rams!) next fall and will eat who-knows-what once he gets there. At least I can stock his freezer knowing he has something healthier to fill his stomach with when he’s up late during those all-night study (and gaming) sessions (and is more keen on dialing out for pizza than dialing in the oven temperature for a home-cooked meal). Disclosure: Atkins has provided these meals free of charge for review, but this has not affected my review of the item(s) received. That’s why they didn’t have them yesterday, I’ll have to go back after the 15th. hope my walmart has them! They should definitely have them in this month. Next month, I believe they’re rolling out at stores all across the country. Sounds good. Whats the sodium content look like? Hey there! The sodium is highish, but low-carbers tend to need a bit more sodium. I never noticed the sodium in terms of taste, and I didn’t have any issues as a result of the added salt, so that is encouraging. Oh yay! The only acceptable LC frozen foods (not speaking of ice cream) that I have found have been a few things at Indian markets (e.g., chicken tikka masala and saag paneer). These will really help when one just needs something quick to eat and thus, I think, will help folks stay on track. I do wish, per usual, that the ingredients mirrored what one might find in home kitchens though. I am hopeful that as they roll out more foods, they might be able to revisit, minimally, gluten-free, soy-free, and MSG-free options. 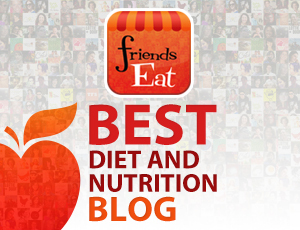 Do you know the true carb count? Sad but a lot of diabetic don’t and can’t use the net count. This is truly exciting news . Sound like the carbs should be at a low level. Weigh Watcher dinners will kill you in carbs. Amazingly, my Walmart has two, the turkey and green beans and the crustless chicken pot pie. I agree, the turkey one was really good, I’ll try the other one or lunch today. The pot pie looks pretty terrific. The turkey was far and away my favorite. How does the fat look? I hope it’s high! That coupon expires 12/31/2013! Plenty of time to find them in stores. There are usually some good promos when new products are released, so I’m hopeful! These will be perfect for those times I forget to save some leftovers for the hubs to stick in his lunchbox. The fat’s pretty decent! It’s high enough to be filling, but low enough that if you’re counting calories, you won’t swoon across a fainting sofa. Thanks for reviewing them. I will check them out! Soy and Wheat? Thanks for nothing! I cannot find the coupon here or on Atkins site. Lee, it’s at the link here. Let me post it again: http://bricks.coupons.com/Start.asp?bt=vg&tqnm=xlfmbnm23603951&o=107842&c=AK&p=VPNTxOJr Hopefully that’ll work. I’m drooling! Can’t wait to head to Walmart (as soon as this snowstorm blows over). Where do you buy the frozen meals? Hi, Sandra. Right now they’re at WalMart Supercenters across the country, but Atkins is rolling out in other stores in January. I just bought the Meatloaf today at Walmart, and it is ABSOLUTELY ATROCIOUS- smell, texture, taste… everything. Ugh, if I lived closer to the store, I would have taken it back, it was that bad. That sounds pretty bad! I am pretty picky when it comes to meatloaf, so I likely won’t try that one. Thanks for the heads up! The pot pie has me curious, though. I heart the pot pie one! I poured it over some cauliflower rice. That sounds really delicious. What a great idea, to pair rice with it! They taste so good because each dinner has almost 1000mg of sodium and 30g of fat in it…that’s not healthy at all especially if you already have high BP or heart disease. All that sodium will cause water retention also. Take notice to the ingredients listed on the front. All the stuff that’s low… nothing about the bad stuff. I found the beef merlot at 2 different super Wal-Mart’s but had to drive a total of 120 miles to secure 10 meals. They sold out fast! The beef merlot is delicious! 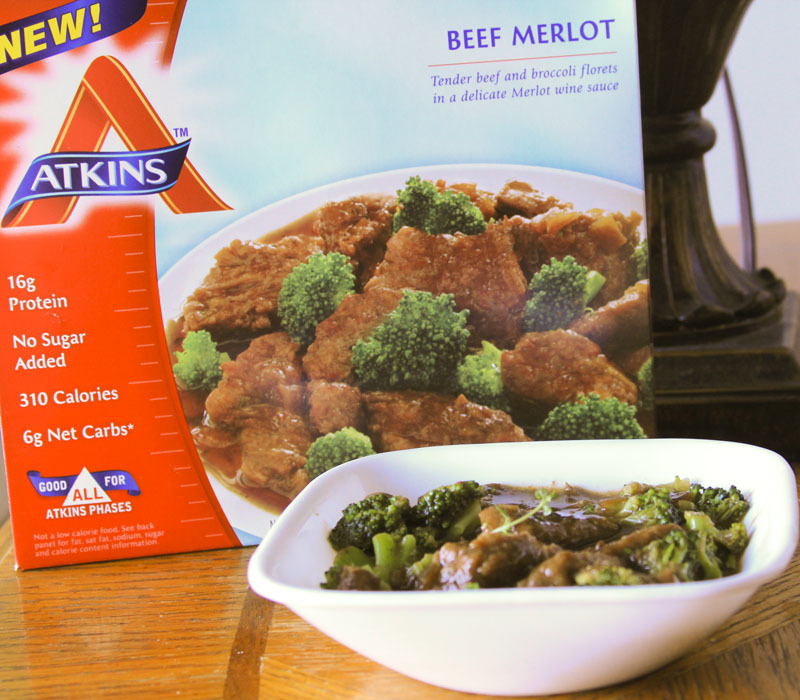 I would like to see all grocery stores carry a variety of Atkin’s frozen meals. I LOVE these! 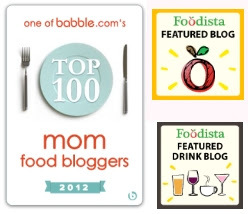 I am a very busy single mom working 50+ hrs and I was struggling trying to find breakfast and lunches that I could eat on the run.I would end up cheating on my diet OR spending a TON of money at restaurants. This works! I felt guilty at first. We all want to be super woman and cook everything but reality sets in and if this gets to me eat AND stay on my diet. AWESOME!! Love love love them!! When are these frozen meals coming to Australia? IS THERE A CHANCE YOU’LL BE ABLE TO PURCHASE IN AUSTRALIA? When will these be available in Australia?